Novak Djokovic and Roger Federer will be facing each other for the 45th time in their careers during Australian Open semifinal action on Thursday. A four-team panel previews the action and makes its picks. Ricky Dimon (The Grandstand): Federer toppled Djokovic at the World Tour Finals last fall, but that came during round-robin action when Djokovic knew he would have a lifeline in London even if he lost. In the championship match a few days later, the world No. 1 restored order to the proceedings and took care of Federer 6-3, 6-4. The question is: can the 34-year-old Swiss pull off an upset in a pressure-packed match? Even when he was at his very best last summer, coming off a title in Cincinnati, Federer fell to Djokovic in a four-set U.S. Open final. He is still playing well, but arguably not at the same level. Djokovic sprayed a laughable 100 errors against Gilles Simon, but–as expected–that proved to be nothing more than a wake-up call. Djokovic 6-2, 6-7(6), 6-4, 7-5. Steen Kirby (Tennis Atlantic): Federer has dropped just one set thus far. Djokovic was pushed to five by Simon, but both of these top players look to be in a great form heading into this matchup, and fully healthy and rested to give their best. Federer has been able to compete against–and defeat–Djokovic in recent years on outdoor hard courts, but those wins have come in best-of-three ATP matches. Djokovic is undefeated on the season and has had a decisive edge in best-of-five scenarios against Federer in recent years. With both players in good form, Djokovic should once more have the edge in this match as the true world No. 1. Djokovic 6-4, 4-6, 7-5, 6-3. Pete Ziebron (Tennis Acumen): For years it was a difficult task to defeat Federer in a best-of-five match. He could occasionally be beaten in a best-of-three format, but majors were an entirely different story. Today, it is Djokovic who is near-impossible to defeat on any surface, in any tournament, and in any format. Last year Federer handed Djokovic three of his six setbacks, but all were in the best-of-three format. The last three times they have met in majors have produced some of the more memorable matches in their rivalry, especially in the Wimbledon finals in each of the last two seasons. Each time, Federer played exceptionally well but Djokovic was just a bit better across the board. Expect a similar result again in this, the 45th chapter between two of the greatest players of all time. Djokovic 4-6, 6-4, 3-6, 6-2, 6-4. Jared Pine (Second Serb): With the forecast calling for rain, the roof will likely be shut in Rod Laver Arena, which will make the already slow court even slower and making Federer’s attacking style difficult to execute. If Djokovic wins the match, he will have a winning record against Federer, Rafael Nadal, and Andy Murray. The Serb has been the best player in tennis over the last five years. A winning record against Federer would be a huge accomplishment for Djokovic to hang his hat on. Djokovic 6-7, 6-4, 6-3, 7-5. Ricky Dimon of The Grandstand and Pete Ziebron of Tennis Acumen preview and pick the four men’s singles matches on Sunday at the Australian Open. Roger Federer is back in action against David Goffin. Ricky: Goffin had some near-disastrous mental walkabouts in the first two rounds but survived both in four. He also needed four sets to beat Dominic Thiem on Friday but that featured a much better performance in a very high-quality match. Federer won in four in the third round, as well, in a mediocre showing against Grigor Dimitrov. Facing his idol for the fourth time, Goffin should be less psyched out than he was in the previous meetings. But he is 0-3 lifetime against Federer and that will be 0-4 after this one–but not before flashes of outstanding play from both guys. Federer 6-4, 4-6, 6-1, 6-3. Pete: Has it really been nearly four years since a relatively unknown Goffin stole the first set in his fourth-round match against his idol Federer at Roland Garros? It has been that long and after a rough patch a few years ago, the trajectory of Goffin’s world ranking has climbed steadily. Both Federer and Goffin played four-set matches in the third round. For Federer, dropping a set was most likely a slight wakeup call and he responded mightily, dropping just five games the rest of the way against Dimitrov. Goffin meanwhile, had to scratch and claw his way to victory against Thiem in one of the more entertaining matches this fortnight. Following the match, Goffin even playfully boasted that he could play his next match that same day. Getting back to reality, expect a near carbon-copy of Federer’s performance against Dimitrov in this match. Federer 6-3, 4-6, 6-2, 6-3. Ricky: These are two of the most talented, most injury-plagued stars on tour. Tsonga (knee) was the one who dealt with physical problems during the offseason, but now it is Nishikori (wrist) who is question mark. All things being equal, this should be a good one. They faced each other at the same stage of this same tournament in 2012 and it went to five sets, with Nishikori prevailing. Aside from Nishikori’s minor injury scare against Guillermo Garcia-Lopez, both men have been in stellar form through three rounds. Tsonga, who loves it Down Under, is just barely a safer pick. Tsonga 6-3, 4-6, 6-7(4), 6-3, 6-2. Pete: Tsonga and Nishikori have met twice before in majors and both have gone the distance, with Nishikori coming back from a two set to one deficit to win four years ago in Melbourne and Tsonga winning last year at Roland Garros. The last round featured familiar scenes involving the players: the trainer was once again called by Nishikori, while Tsonga hit yet another inexplicable one-handed backhand for a winner at a crucial point. Tsonga blasted 23 aces two days ago, while Nishikori managed just a single ace through the first three sets before finishing with five. In short, Tsonga is playing well and too many questions currently cloud the physical ability and reliability of Nishikori’s game, especially as the tournament progresses and he must face better talent. The former Australian Open finalist will prevail. Tsonga 7-6(4), 4-6, 6-3, 7-5. Ricky: A lot of people–me included–thought this would be Marin Cilic vs. Nick Kyrgios. Not so much. Bautista Agut has been on fire of late and Berdych was too good for Kyrgios. At what point is the Spaniard’s run going to end? He won the Auckland title, survived consecutive five-setters on Melbourne, then upset Cilic on Friday. With a 2-3 record against Berdych, Bautista Agut will certainly have belief. But the Czech positively thrives at this tournament and his power may be too much. Berdych 3-6, 6-4, 6-2, 7-6(5). Pete: So far this January, Bautista Agut has recorded wins over heavy-hitters such as Tsonga, Cilic, John Isner, and Daniel Brands. He also claimed the Auckland title a few weeks ago. Next up is yet another blaster from the baseline in Berdych, who ousted Kyrgios in the second round. Berdych has fared well at the Australian Open, reaching the semis each of the last two years. He also reached the quarters for three consecutive years before finally advancing to the semis in ’14. More recently, Berdych played a highly competitive match against Djokovic in the Doha semis earlier this month. The favorite’s experience, particularly in Melbourne, provides him with a significant advantage in this fourth-round encounter. Berdych 6-4, 6-3, 5-7, 6-3. Ricky: Djokovic leads the head-to-head series 9-1 and it is arguably even more lopsided than that score suggests. That’s because the top-ranked Serb has won eight in a row at Simon’s expense after losing their first showdown back in 2008. Djokovic has done just enough so far in Melbourne to advance without dropping a set. When necessary, he will raise his level–and it may be necessary against Simon. Expect plenty of entertaining rallies, but Djokovic will obviously be way too good for this familiar foe. Djokovic 6-4, 7-5, 6-4. Pete: Since dropping their first meeting way back in 2008, Djokovic has won nine consecutive matches against Simon. After going 27-1 in majors last year, Djokovic is determined to keep his stranglehold on the ATP field and will relish the fact that the competition will continue to get stronger as he continues to advance in the draw. Simon is fortunate to still be playing in Melbourne, as Donskoy wasted golden opportunities to eliminate the Frenchman in the second round. That said, Simon is indeed alive in the draw and will play like the 14th seed that he is in this match. Unfortunately for the underdog, he is facing Djokovic–who currently has all of the answers against any and all opponents. Djokovic 6-3, 6-4, 6-3. Ricky Dimon of The Grandstand and Pete Ziebron of Tennis Acumen preview and pick the four best men’s singles matches on Wednesday at the Australian Open. Roger Federer is contesting his second-round match against Alexandr Dolgopolov. Ricky: Just as it is for many players against Federer, Dolgopolov’s head-to-head history is less than encouraging. The Ukrainian retired while trailing Federer 6-4, 5-2 in the 2010 Basel first round. He later lost to the 17-time major champion 6-3, 6-1 at the 2014 Indian Wells Masters. In search of a fifth Australian Open title, Federer thrashed Nikoloz Basilashvili 6-2, 6-1, 6-2 in one hour and 12 minutes on Monday. Dolgopolov isn’t Basilashvili–in fact, he is one of the best unseeded players in the field–but he won’t have the game or the belief with which to come close to an upset. Federer 6-3, 7-6(3), 6-3. 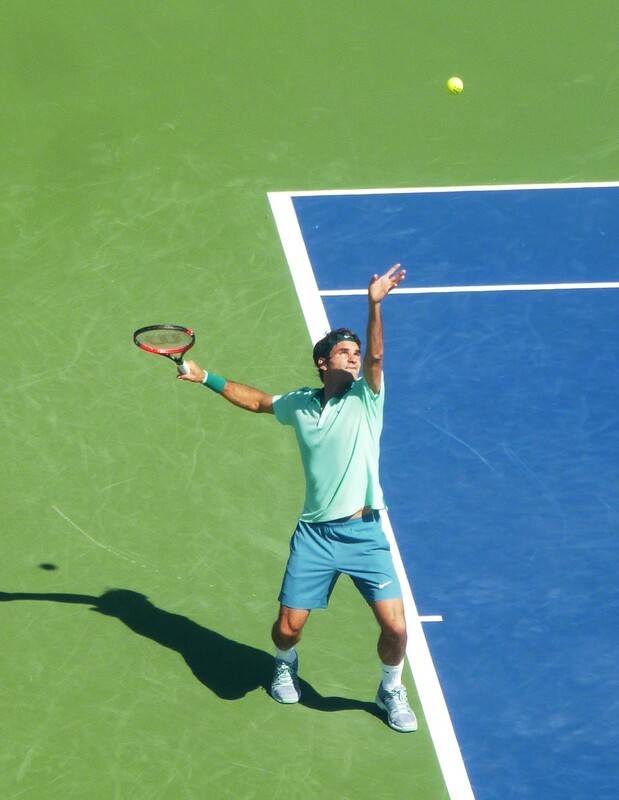 Pete: Federer once again exhibited his dominating presence in the early rounds of a major when he dropped just five games in thrashing Basilashvili in the opening round. While he will face a stronger foe on Wednesday Dolgopolov, this second-round match will seem like a “shoot-around” for the Swiss, especially since Dolgopolov has not played solid tennis since last August–when he scared the daylights out of world No. 1 Novak Djokovic in the Cincinnati semifinals. While the Ukrainian has the talent to threaten the best in the game, it will once again be business as usual for Federer in week one. Federer 6-2, 6-4, 6-3. Ricky: After missing the second half of 2014 because of a foot injury, Almagro’s 2015 comeback was mostly slow-going. The Spaniard faced a fellow injury-plagued veteran in Julien Benneteau during first-round action, advancing in straight sets. An in-form Thiem will be a much tougher test. The 22-year-old Austrian should have settled down following a difficult opening matchup. Not only was he coming off a retirement in Sydney (foot blister), but he also had to face the third-highest ranked unseeded player in the tournament in Leonardo Mayer. Thiem impressively survived in four. The one-handed backhand display in this one will be sweet, but Thiem is on the rise whereas Almagro appears to be on the way down. Thiem 6-2, 7-5, 3-6, 6-3. Pete: Thiem continued to make strides on hard courts in 2015, advancing to the Miami quarterfinals and threatening Andy Murray along the way. Just a few weeks ago, Thiem recorded an impressive hard-court win over former U.S. Open Champion Marin Cilic in the Brisbane quarters. Former top 10 player Almagro has not been the same since retiring in the first round of play at Roland Garros in 2014. While Almagro is still attempting to find his way back to pre-injury form, his best results last year were on clay. Thiem will continue to progress in 2016 and reach the third round Down Under for the first time in his career. Thiem 6-3, 6-4, 5-7, 6-2. Ricky: Rubin took out No. 17 seed Benoit Paire in straight sets then promptly got called a “not good player” by the Frenchman. If Rubin isn’t good, what does that make Paire? Whatever the case, the American has to be feeling sky-high following a 7-6(4), 7-6(6), 7-6(5) victory that was by far the biggest of his professional career. Herbert scraped through qualifying to get into the main draw before beating Pablo Andujar in four sets. This will be a fun matchup between the 23-year-old Herbert and the 19-year-old Rubin. Although this Frenchman is not as talented as Paire, he is mentally stronger. Herbert 6-2, 6-7(5), 6-4, 6-2. Pete: Can Rubin, ranked No. 328 in the world, manage to knock off a second consecutive Frenchman? The USTA Australian Open Wild Card winner absolutely stunned Paire in the opening round, winning three straight tiebreakers. Next up will be a qualifier in Herbert, who engineered an amazing run all the way to the Winston-Salem final last summer, winning eight matches before competing very well against champion Kevin Anderson. Herbert will be playing with house money in this match as he won his final qualifying contest 9-7 in the third set against Edouard Roger-Vasselin and erased a one-set deficit on Monday against Andujar. Expect the doubles expert to rely on his crafty experience to advance. Herbert 7-6(4), 5-7, 6-3, 7-6(5). Ricky: Neither man is any stranger to five-set marathons Down Under. Of Seppi’s 21 career Australian Open matches, an incredible 10 have have gone the distance. In last year’s first round, Kudla lost to Lopez 10-8 in the fifth. Another one could be in store on Wednesday, even though Seppi is ranked 40 spots ahead of his opponent (28th to 68th). The Italian’s form has been mediocre of late and he is coming off a lengthy four-set battled against Teymuraz Gabashvili. Kudla, on the other hand, was crushing Filip Krajinovic through two sets before the Serb retired. This one has five written all over it, with Seppi having a slight edge due to his experience and level-headedness in pressure moments. Seppi 5-7, 7-5, 6-2, 3-6, 6-4. Pete: Seppi lost five of his last six matches on hard courts to close out 2015. Meanwhile, he also lost two more matches to players ranked significantly lower than him prior to arriving in Melbourne. In the Italian’s opening-round win, Gabashvili actually won four more total points. But wait–we are talking about the Australian Open, the scene of Seppi’s shocking third-round upset of Federer last year. Kudla, meanwhile, is making his second-round debut at the Australian Open in four tries. Kudla should surpass his career-high ranking of world No. 65 with his opening-round win, but Seppi is playing in his 43rd consecutive major and sees Kudla as a mere impediment on his way to a likely third-round match against Djokovic. Seppi is determined to have a crack at being able to top his signature win of last year at the same venue and in the same round. Seppi 6-2, 7-6(2), 7-5.